Apart from the English Premier League which has seen a stop of games of the 5th round of the FA Cup, there were exciting games in European 5 major leagues. And once again, Africans have shined. Pierre Emerick Aubameyang of Gabon scored twice in the show of Borussia Dortmund. Everton – Swansea was an opportunity for Lacina Traore to make his England debut. And the Ivorian has not missed his first game. Scorer at the 5th minute on a heel, the player on loan from Monaco participated in the Toffees 3-1 qualification for the next round. Mainz has left no chance to Hanover during their confrontation in the day (2-0). Tuchel ‘s men have emerged thanks to a second goal of the Cameroonian Eric Choupo -Moting. 12th and 13th goals of the season for Pierre- Emerick Aubameyang. As he found a place of holder for 4 games, the Gabonese shines. Thanks to his double strike, Borussia Dortmund crush Frankfurt 4-0. The former Saint-Etienne is now Bundesliga 2nd top scorer. Einstract Brunschwick nailed deeper Hamburg. The promoted was largely dominator 4-2 and an African distinguished himself. Domi Kumbela, Congolese-born attacker scored a hat trick. This offered a smile to the red lantern. If Juventus easily won 3-1 before Chiveo Verona, it is also thanks to their Ghanaian defender Kwadwo Asamoah. The former Udinese scored his first goal of the season with a beautiful curling shot. 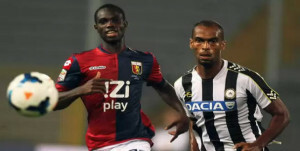 Genoa returned from afar this weekend against Parma. Led 3-1 at the time of the game, players of Liverani returned to score thanks to Alberto Gilardino’s brace. But before that, the Senegalese Pape Moussa Konaté had reduced the scoring by his first goal in Serie A. A draw that does not help anyone. Marseille held in check Saint -Etienne 1-1 Sunday at the closing of the 25th day of Ligue 1. The opportunity for Cameroon’s Nicolas Nkoulou to score his first goal of the season. African scorers during Evian TG – Lille (2-2). The Kenyan-born Belgian Divock Origi and Cape Verdean Ryan Mendes of LOSC have responded in particular to the goal of Congolese Cédric Mongongu on penalty for the Upper Savoy. Not only does he impress every weekend at his right back position, but also Serge Aurier scores too. Illustration Saturday as he netted the second goal of Toulouse during the 3-1 win at Lorient. He also deserves the nickname of Super sub. Souleymane Camara is the most prolific scorer off the bench in Ligue 1. He struck again this weekend by winning the match point 2-2 for Montpellier pitted to Rennes. This is his 18th goal as a substitute. Lyon did not tremble against Ajaccio (3-1). Malian-born Gueida Fofana has again scored a goal on a long shot while the Kenyan Dennis Oliech has tried to keep his team afloat. But In vain! Sochaux won again and maintained hope. Once again, it is their flagship rookie in the defense who did the job. Zambian Stoppila Sunzu scored the only goal of the 1-0 win at Guingamp.